The Rattle Box is a classic prop for vanishing a borrowed coin from a spectator’s hands, and having it appear elsewhere. This is a slightly larger model, in a deluxe wood finish, that will enable you to perform the effect with any borrowed coin or finger ring. 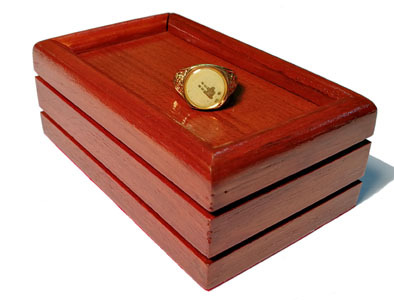 This box measures about 4.5″ long, 3″ wide and 1.75″ high. Besides any coin, it can be used to vanish almost all finger rings, tie clips, keys or similar items. The rattle feature allows a spectator to “hear” the coin or ring in the box, after the item has been “stolen away”. A utility prop in a deluxe finish, at a very affordable price. Supplied complete with instructions.